Wait a minute, aren't we already streaking again? 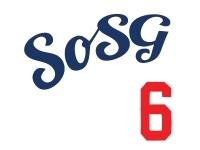 Well, it's not easy cleaning up dirty laundry around the SoSG bar, but the end of the Dodgers' 18-consecutive-series-without-a-loss streak seemed like it should be worth noting, even if it's a delinquent PGT. The Red Sox took the rubber game thanks to a complete game from Jake Peavy, who allowed one run and only three hits. Meanwhile, Boston got all over Chris Capuano (who took the loss; 5.0 IP, 6 H, 3 ER) and Chris Withrow (2.0 IP, 3 H, 3 ER). So, on national television, 19 didn't materialize. Blecch. Shake it off, Dodgers, and let's start a new streak.